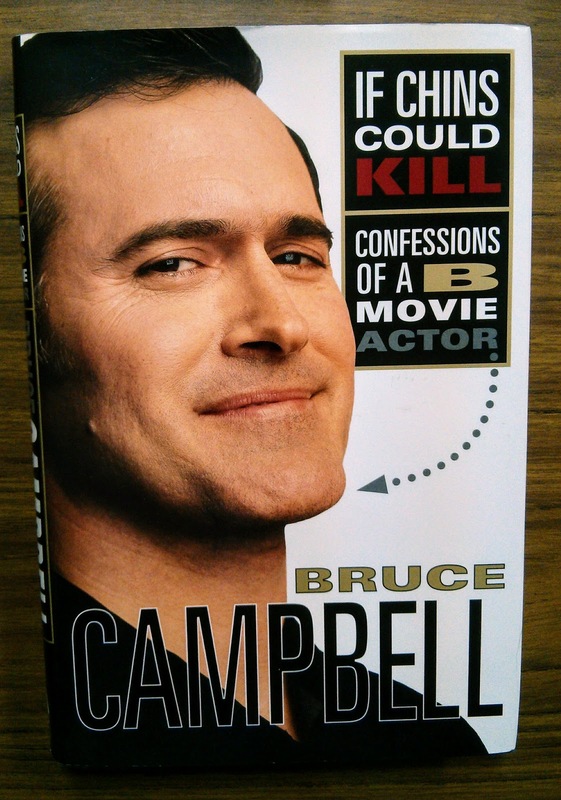 Back in October 2001, I was really excited that THE Bruce Campbell of Evil Dead fame would be coming to speak at the University at Buffalo. 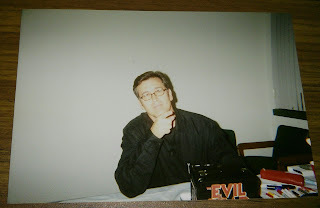 He was touring for his first book If Chins Could Kill: Confessions of a B-Movie Actor, and he was scheduled to give a lecture, then stay after to sign books and paraphernalia. 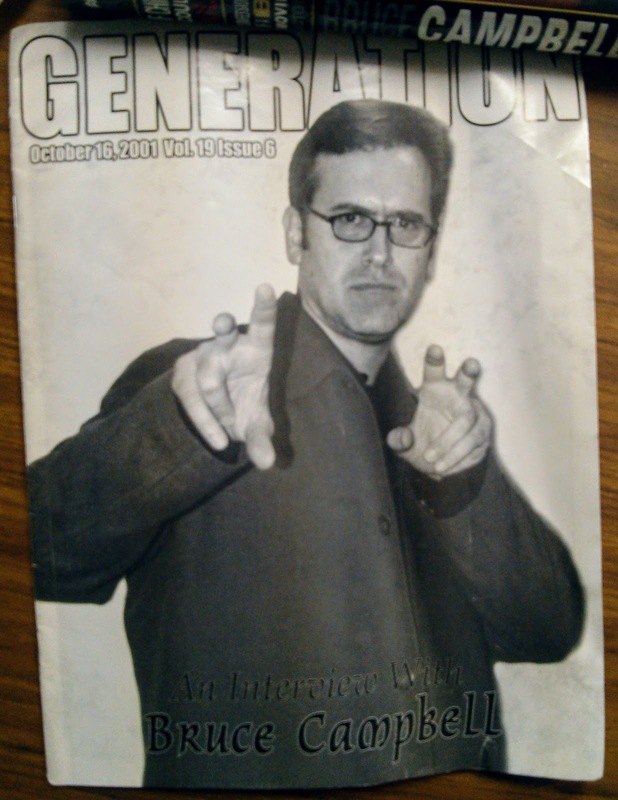 I remember his lecture was charming, interactive, and very funny. I was eager to meet him! Afterall, I was the fan that had an Evil Dead themed party complete with movie viewing, and games like Pin-the-Hand-on-Ash. (a cooler version of Pin-the-Tail-on -the-Donkey)! Extra points for getting the wrist and arm area! For those that don't know ~ in Evil Dead II: Dead by Dawn his character, Ash, looses a hand and replaces it with a chainsaw. His lecture concluded, and it was time for the meet and greet. The cult icon said anyone that brought his book to be autographed could line up first. Well I already had his book AND I already had it signed too. Let me explain. When Andrew and I were still dating he interned in New York City and lived there during the summer of 2001. 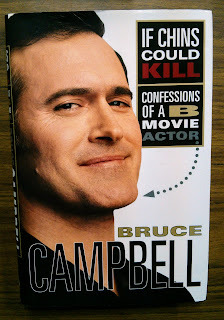 Bruce Campbell was signing books at the Barnes and Noble in the bottom of the World Trade Center and Andrew, my *now* husband, gave me an autographed copy for my birthday. Instead of bringing the already signed book, I brought a VHS copy of Evil Dead II. I was second to last in a line of about 100 people. After waiting about two hours and finally going up to his table, I did something I NEVER thought I would do. I fangirled. 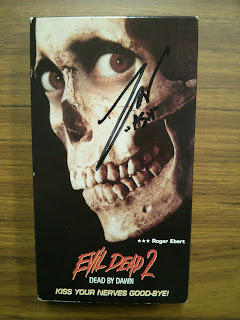 I rambled on to the great Bruce Campbell about how much I loved his movies, I told him about my Evil Dead party and Pin-the-Hand-on-Ash and how I thought he was awesome. His response was (and I'll never forget it), "So what do you want me to sign?" Well I guess after meeting the 98 people in line ahead of me ~ most with his fancy new book ~ he was done and didn't have to be charming anymore. I slid over my VHS and asked to take a picture. He said,"Sure." and that was the end of the Bruce Campbell encounter. Needless to say it was disappointing. Just as he was exhausted from the fans, I was exhausted from waiting in line to get treated like a schmuck. 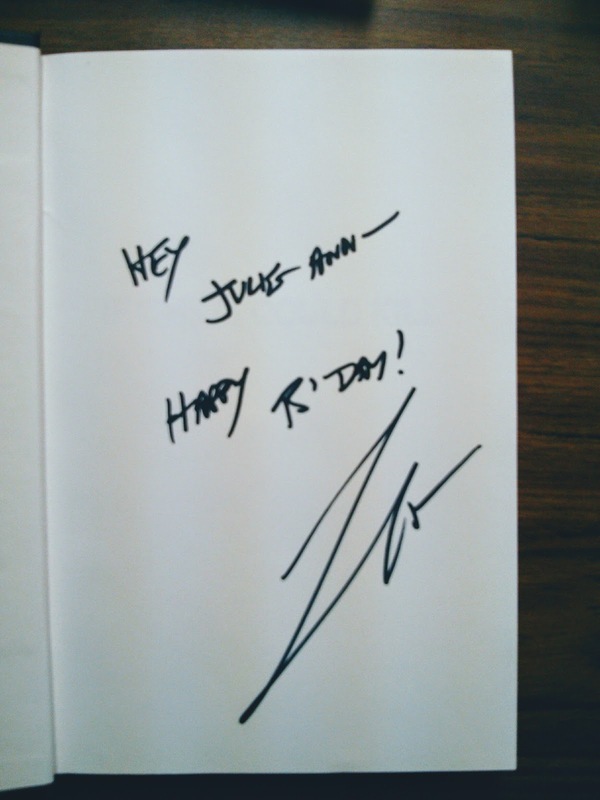 Little did HE know I already had his book signed, from a place that no longer existed. A snapshot of the "Sure." photograph. Don't get me wrong I'm still a fan, and watch Ash vs. Evil Dead. It's campy with lots of unnecessary blood ~ my kind of show ~ but I don't need to meet him again. When I heard he's touring to promote his latest book Hail to the Chin and the closest city will be Toronto ~ I thought good, I can appreciate him from a distance. I'm not sure what I expected. Maybe the pedestal I had him on was too high. Maybe it was about timing, both of us were tired. Maybe I AM a schmuck. Hopefully if you ever meet him, your experience will be gratifying. You can find all the dates and cities for his new book tour here. It's actually a very interesting read. I enjoyed it.